Last week's Olive Editions pocket reader contest was so much fun (drawing over 130 entries, I have decided to make contests a weekly staple of Largehearted Boy (when practical). I have often thought the world can be divided into two camps, those who "get" Monty Python and those who don't. If you enjoy the groundbreaking British comedians, this contest is for you. This week's prize is The Complete Monty Python's Flying Circus: Collector's Edition Megaset. 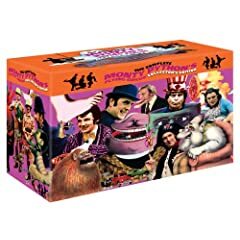 This 21-disc collection features the entire television series, the Personal Best specials of the six principal actors, two live performances, as well as two documentaries about the comedy troupe, Before the Flying Circus and Monty Python Conquers America. To enter, leave a comment recommending your favorite television comedy of all time. The winner will be chosen at random late Wednesday evening (February 25th).